If us kayak anglers stayed home when the wind was blowing, we would never get out on the water. Beating the wind is a big deal when kayak fishing. Fishing on a windy day is no reason to cancel a fishing trip. With the right preparation and planning, kayak fishing on a windy day can be very productive. 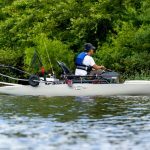 Let’s take a look at some tips to beating the wind when kayak fishing. All fishos appreciate the importance of good gear. As a kayak angler, a great paddle is all important. A great paddle will mean you are putting less effort in for more reward. Lighter paddles are easier to use for extended periods of time. 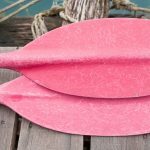 Being able to feather the blades on your paddle is another huge plus because it allows one end of your paddle to slice through the water while the other end of the paddle is pushing hard against it. 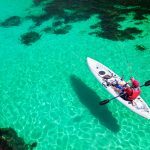 Paddling with feathered paddles takes a little practice but the advantage of a feathered paddle is certainly worth it. A long day is a very long day when you are feeling fatigued. Take your time and save your energy for when you get to where you want to go. 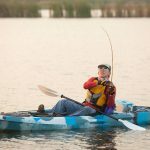 Many newbie kayak anglers get so excited they wear themselves out in a rush to getting where they want to go. You don’t have to start kayaking where you are going to finish. 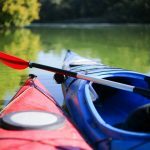 If you can take advantage of the terrain and the currents, you are kayaking smart. The key to using the wind is to launch and exit in the same direction. By doing so, you are taking advantage of the wind and surface currents. Staying close to wind-protected shorelines will really help to minimise the effect of crosswinds. The water near the shoreline is often naturally shielded from the powerful effects of the wind. If the wind is blowing from the east, you want to stay on the east side of the shore. When it is really windy and you are fighting to make ground, you can always get out and wade your kayak. Sure, the going is slow but you will conserve more energy until you can get to a place with less wind or more protection from it. One of the big advantages of fishing, when the wind is blowing, is taking advantage of the small water gaps created by islands and land formations. 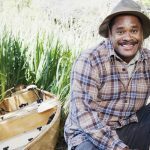 The trick is to find a channel that runs along the same lines as the wind is blowing and troll or cast for fish waiting just outside of the current to catch prey passing by. In this case, you are the one passing by and they are the prey.